P-Rex1は，PLEKHG2とは異なり，DEP, PDZ, IP4Pドメイン構造を有する．DH：Dbl homology, PH：plekstrin homology, DEP：Dishevelled, Egl-10 and Pleckstrin, PDZ：PSD95, Dlg1 and zo-1, IP4P：inositol polyphosphate-4-phosphatase. 1) Hall, A. (2005) Biochem. Soc. Trans., 33, 891–895. 2) Schmidt, A. & Hall, A. (2002) Genes Dev., 16, 1587–1609. 3) Laurin, M. & Côté, J.F. (2014) Genes Dev., 28, 533–547. 4) Hepler, J.R. & Gilman, A.G. (1992) Trends Biochem. Sci., 17, 383–387. 5) Welch, H.C., Coadwell, W.J., Ellson, C.D., Ferguson, G.J., Andrews, S.R., Erdjument-Bromage, H., Tempst, P., Hawkins, P.T., & Stephens, L.R. (2002) Cell, 108, 809–821. 6) Rosenfeldt, H., Vázquez-Prado, J., & Gutkind, J.S. (2004) FEBS Lett., 572, 167–171. 7) Ueda, H., Nagae, R., Kozawa, M., Morishita, R., Kimura, S., Nagase, T., Ohara, O., Yoshida, S., & Asano, T. (2008) J. Biol. Chem., 283, 1946–1953. 8) Runne, C. & Chen, S. (2013) Mol. Cell. Biol., 33, 4294–4307. 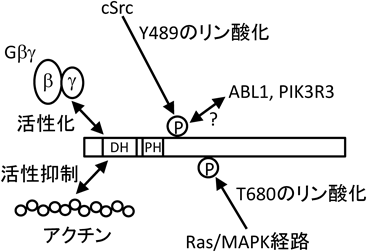 9) Kimura, S., Sato, K., Banno, Y., Nagase, T., & Ueda, H. (2013) Biol. Pharm. Bull., 36, 1204–1207. 10) Sato, K., Suzuki, T., Yamaguchi, Y., Kitade, Y., Nagase, T., & Ueda, H. (2014) Cell. Signal., 26, 691–696. 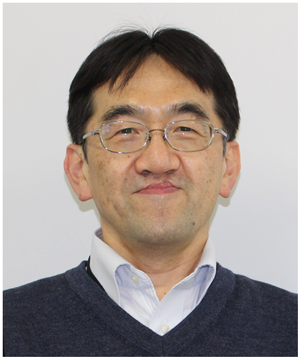 11) Sato, K., Sugiyama, T., Nagase, T., Kitade, Y., & Ueda, H. (2014) J. Biol. Chem., 289, 10045–10056. 12) Sato, K., Handa, H., Kimura, M., Okano, Y., Nagaoka, H., Nagase, T., Sugiyama, T., Kitade, Y., & Ueda, H. (2013) Cell. Signal., 25, 41–49.